Whether you’re an aquatic director, swim school owner, or swimming instructor–IF you’re looking for Cyber Week savings–you found it! 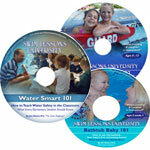 Most everything on the Swim Lessons University website is 20% OFF all week! These items and much, much, more! PLACE YOUR ORDER TODAY! Would you consider dedicating 30-minutes of your child’s week to swimming instruction if you knew it could determine life or death? Of course you would! As fall approaches, I urge parents to consider continuing the pursuit of helping your child be the safest and strongest swimmer he/she can be! Sure, we are all busy with school, other sports activities, etc., but the last thing we should do is substitute other activities for swimming instruction when our child is not yet a strong swimmer. As a physical educator and coach, I am a HUGE advocate of children participating in multiple sports and activities. My three boys play baseball, basketball, soccer, and have done karate. 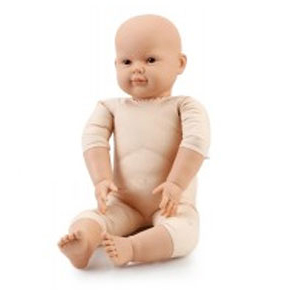 But I would never substitute one of the sports at the cost of my child’s safety. So just because the fall sports season is approaching, please continue your commitment to your child’s swimming safety and skills. Learning to swim is a process, not an event. Just like those who believe in karate for self-defense, stick with it, and pursue a black belt–EVERY PARENT should have their child pursue a “black belt in swimming” for their child’s safety. The International Swimming Hall of Fame has named Jim Reiser the recipient of the 2015 Virginia Hunt Newman Award for his approach in teaching infants, toddlers, and children to swim. Jim is the first American to win the award in 20 years! World Aquatic Babies & Children Congress as the President’s Award Recipient for world-wide contributions to learn-to-swim. Youth Sport Parents Priorities MUST CHANGE to PREVENT DROWNINGS! It was the summer of 1982. I was just 13 years old when I got my first job as a Swim Instructor Aide teaching under my father at his swim school in Johnstown, PA. Between 1982 and 1990, I not only continued teaching, but I played about every sport I could play. As a youth and teen, it was swimming, baseball, soccer, football, and basketball. In high school, it was football, basketball, track, and swimming. Oh yes, and I fiddled with karate after breaking my hand in 1985, and later pursued and earned a black belt in Tang Soo Do. In college, after playing football my freshman year at California University of Pennsylvania, I started my own lean-to-swim program as a sophomore. While I wanted to keep playing football, a back injury during spring ball cut that career (going nowhere) short! While rehabilitating my back in the university pool, I got this idea to propose a Swim Lessons Program and lease the University pool. After a lot of perseverance, it was finally approved. In no time at all I knew I found my calling. I ended up in Columbia, SC after accepting a graduate assistantship to teach aquatics for the University of South Carolina’s Physical Education Department while pursuing my master’s degree in Physical Education and Motor Skill Development. I will be 46 years young next month, and coaching sports has been a huge part of my life. Coaching and teaching is my life. To me, nothing is more rewarding than utilizing sport to teach life skills to kids. And sports are a wonderful medium to do that. 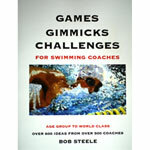 From 1993-2005, I coached year-round competitive swimmers from novice to elite, producing 20 National Top 16 Qualifiers. For the past year and a half, I have been having the time of my life coaching my son’s AAU Basketball Team! But while there are so many benefits our youth can learn from participating in most all youth sports with the right coach–there is one thing that cannot be denied about swimming: “Swimming is the only skill that can save a child’s life.” The problem is, I don’t believe this statement is taken anywhere seriously enough by parents across the United States. Why do I say this? Because when I am not writing curriculum for Swim Lessons University or working on The Swim Lessons Company, I spend the majority of my life in the gym and on the local ball fields. What do I see? I SEE THOUSANDS of YOUNG KIDS playing t-ball, soccer, and basketball… And I know there are thousands of others also doing dance and gymnastics. I WOULD LIKE TO APPLAUD EVERY SINGLE PARENT for giving their child these wonderful opportunities … BUT I CAN’T! Why? Because my educated guess is that the majority of them can’t swim or they are WEAK swimmers! And rather than making sure these children are learning a skill that could also save their life, parents are turning a blind eye to this fact. Instead, parents are enrolling their children earlier and earlier in these other sports are hoping their son or daughter becomes the next Michael Jordan, LaBron James, Babe Ruth, Willie Mays, Tom Brady, Walter Payton, Pele, Lionel Messi, Roger Federer, Venus Williams, or Nadia Comaneci. But the fact is…DROWNING TAKES MORE LIVES THAN ANY OTHER ACCIDENT for children under the age of six, and ranks 2nd only to AUTOMOBILE ACCIDENTS for ages 6-14. The point of my writing today is to ask you to consider re-prioritizing your child’s activities, especially if they can’t swim or swim well enough to save themselves. Take a look at this blog, “SWIM LESSON OBJECTIVES,” which outlines what your child should be able to do at a variety of ages. Would your child pass the test? You can watch video samples of what I believe is a reasonable objective at a variety of ages. You can find all those videos and blogs on this site! For example, here is a link to the blog of what every 3 & 4 year old are capable of learning if taught by a qualified instructor. PLEASE REMEMBER THIS: Learning to swim is a process, not an event! 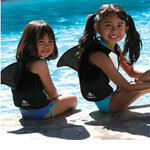 Don’t wait until summer to enroll your child in swim lessons. Find a child-centered, progressive swim program near you today! NCAA Swimming Scholarships may become EXTINCT! You read it correctly! IF we care about the sport of swimming, whether you are swimming instructors, swim coaches, swim parents, or fans–we must get ready to fight for it, as ASCA Executive Director John Leonard writes in his article below. Take a minute to read it now. As always, John’s articles are honest, informative, and to the point. He doesn’t dance around and politic. He tells you the way it is. One of the key roles that the American Swimming Coaches Association has played in American Swimming since 1958, is to warn of threats to our sport. Today, I am going to tell you about the biggest threat to American Swimming in the history of our sport. NCAA Scholarship Swimming is under assault. And very likely to become extinct SOON if we dont act to save it. First, for ALL of us, the USA is the only country in the world where a young man or young lady taking her/his first swimming lesson TODAY, has NO LIMITS on their future! They can choose to swim a little, swim a lot, excel, (or not) go through high school swimming, move on to the worlds most competitive program in NCAA swimming. (which attracts athletes from all over the globe, seeking what they dont have at home) and go on to be an Olympian. Or they can chose to do summer league swimming, swim in high school, move on to academic life, and never swim again. The Point is, THEY HAVE THE CHOICE. In no other place on earth is that the case. In most of the globe, that young lady or man has almost nothing BUT limits – and most, even if they are serious youth swimmers, have no choice but to quit swimming between 15-18 and concentrate on academics which determine their future. No option of Scholarships, no option of elite coaching – no realistic dreams of being the best they can be. Their swimming careers END between 15-18. NCAA Scholarship Swimming KEEPS THE DREAM ALIVE! KEEPS THE OPTIONS, OPEN! Second, for all the reasons outlined above, NCAA Scholarship Swimming is the engine that drives our Olympic/International Success. Those 6,000 NCAA Scholarship Swimmers who keep swimming from 18-24 as they mature (and late maturers are the leading edge of elite athletes) are the talent pool which we have drawn on to lead the world in swimming for more than 100 years now. NCAA Scholarship Swimming is the EDGE that we have over the rest of the Swimming world. IF NCAA Scholarships go away, the USA in ten years will look like a second rate swimming nation. Well have similar numbers of elite athletes, except some of our friends live in countries where swimming really COUNTS in the culture. You all know where swimming ranks in the USA in terms of cultural importance. You’ll hear lots of work ideas and see lots in action soon. We have about a 12-24 month window to save scholarship swimming and elite coaching jobs in the NCAA. Within 24 months, the path will be set. Universities will be either keeping or dropping scholarships and full time elite coaching jobs by then. All of this DRIVEN of course, by the insatiable need for dollars for football and basketball players, and 6 Million Dollar a year football coaches. We will need YOU to rally your teams. Get tons of letters and emails written to University Presidents and Athletic Directors in support of the Real Student Athletes swimmers. The College Swimming Coaches Association of America and the ASCA are working together with USA Swimming to develop the plan, and ask you to work the plan. I am personally so offended by the hypocrisy of the NCAA ad that goes on about “most of them will go pro in something other than sports.” Which implies that the NCAA actually has something to do with that! WHILE the finance of University sport heads inexorably towards the ELIMINATION OF OLYMPIC SPORTS in favor of the semi-pro leagues for football and basketball players. It’s a toss up right now whether the IOC/FINA or the NCAA is the most hypocritical organization in the world of sports today – but that’s a discussion for another day. What is for today is simply this… if you love American Swimming, get ready to fight for it. We’ll need ALL OF US, TOGETHER, to save it. Let’s Go USA. We can do this. Plans coming. House on Fire. Man The Buckets. What do you do when you cancel swim classes for thunder and lightning? BUT shortly after, the weather clears up and the instructors are gone! What do you do when a customer shows up with their little one? BUT you cancelled classes for the day and THEIR CHILD is devastated! What do you do when a pump motor goes bad and you have to cancel class unexpectedly? Even though you reschedule, it is NOT convenient for “some” of your families. What do you do when a student misses class due to illness, travel, or because of another commitment? But you already paid the instructor, you paid your pool rent, etc. I am here to tell you, there is NO one right or wrong way to handle these situations. What is right for your business may be detrimental to mine. What works for me may be a disaster for you. Also keep in mind: What felt comfortable when you wrote your policies and procedures may not feel so comfortable now that you have an angry customer on the other end of the line. This is normal. And this is why we have to always be open to change. Change is inevitable. When you choose to embrace change you will begin to see it as an opportunity for growth. So where do you start? Personally, I start with my customers. If they aren’t happy, quite frankly, I am not happy. Second, I listen to my staff. If they aren’t happy, I am not happy. Third, I listen to my gut. If my gut tells me it doesn’t feel right–it’s time for a change! I did leave out a fourth area that gives you an opportunity for positive growth. Research! 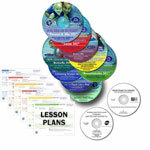 There is no shortage of great information out there. When it comes to customer service, one of my favorite books is called “Customer Satisfaction is Worthless, Customer Loyalty is Priceless, by Jeffrey Gitomer. He really inspired me to make it a policy in my office to NEVER use the term policy. That’s right. We have NO POLICIES! When you’re in the customer’s shoes, how do you feel when you hear the “policy” excuse? Me? I feel that the business doesn’t value me as a customer. When I feel that way, I take MY business elsewhere! Where is “elsewhere?” Usually the nearest competitor! Do I ever feel taken advantage of? Admittedly, I do. It’s not a good feeling either. But only on a rare occasion do we take a stance and put our foot down. Because usually we realize that the alternative is worse. Upset customers tell everyone who will listen their side of the story–not ours. In those situations you not only lose that customer–but perhaps several other potential customers. Today with social media, several can become thousands overnight! So in the end, you have to ask yourself, “is it worth it?” “Which decision will help me sleep better at night?” That’s the bottom line. ____In order to determine your make-up when a class is cancelled due to weather issues, go to www.swimlessonscompany.com and select the “Make-up Schedule” button in top navigation bar. All make-ups due to weather will be posted within 24 hours. ____In the event of an unforeseeable cancellation, i.e., an instructor is sick, pool mechanical problem, water temperature issue, etc.—an SLC representative will call you on the number you listed under “home phone” when creating your account. This is the only contact number shown on the instructor’s roster. If you would rather us call your cell phone, please contact the office immediately to change that information. ____While there are no refunds for missed classes that have been taught, if you miss class due to illness, travel, other obligation, etc., email Jim Reiser at swimprofessor@sc.rr.com Let him know that you missed your class and would like to schedule a make-up. Providing there is a class opening available, we can offer you a makeup at that time during the back half of the session (In other words, once the Live Online Registration Period has ended to avoid over booking a class). If all classes are full and a make-up is not possible during the current session, we are happy to offer you a full credit for that class with no expiration date to be deducted against a future registration. So that’s what our customers “agree to” when they register, whether online or over the phone. There are also a number of other registration agreements, but that’s how we handle “Cancellations & Make-ups” today. I do believe that by publishing your terms and conditions in a contract form, having the customer physically “check a box” beside each term is a very pro-active way of preventing problems from arising. It may not prevent them all, but in the big picture, you will find it to be a very effective strategy. I hope today’s blog helps you! If you would like to schedule a “One-on-one Phone Consultation,” you will be delighted to see how reasonably priced they are. To schedule your personal consultation OR for more information, check it out on the Swim Lessons University website today! If you ever have the chance to enjoy an outdoor Jacuzzi during a pretty winter snow, you will absolutely love it. I would advise against making snow angels upon your exit. Let your husband do that! It will be a lot funnier! SO WHAT ABOUT SWIMMING LESSONS in the COLD? While I am by no means endorsing outdoor swim lessons in the snow, you may be surprised at what you can accomplish if your pool is in the 90-93 degree range, despite cool air temperatures. In the video I posted below, you can see my 3-year old Rex and 4-year old Wells in their swimming lesson yesterday. Do you see any indication that they are cold, uncomfortable, or unhappy? This video was taken October 8, 2013 in Columbia, SC. It was raining and 59 degrees for their 4:00PM lesson! The water, however, was 92 degrees. And as you can see, they are happy as can be, and all they did today was improve their swimming and had lots of fun! Don’t believe it? Here is video evidence, and you can google our weather for today. In my 31 years of teaching swimming lessons and coaching competitive swimmers, I have seen my share of cold swimmers. I have been miserable myself because of cold water. In 1993, I taught swimming lessons in Pennsylvania at Liberty Park in South Fork, PA near Johnstown. The pool was fed by natural spring water. Even during the month of June when air temperatures were in the mid 80’s, I remember teaching and feeling like I was going to freeze to death. Even though the year was 1980, I will never forget swimming in the West Newton Rotary Swim Meet in West Newton, PA. I was twelve. Our Johnstown swim team was in a close race with the Butler Y swim team from Pittsburgh going into the final leg of the relay. But when the Butler swimmer’s anchor leg dove into the pool, the race was all but over. Why? The Butler swimmer barely entered the water and literally erupted to the surface crying and screaming it was so cold. 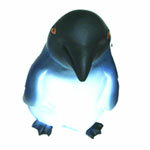 He swam right back to the wall, jumped out of the pool, and we never saw him again! They were disqualified and we won the gold! I would guess that pool was no warmer than 70 degrees that September day which is REALLY COLD WATER. Did you know it is a scientific fact that 80 degree water feels like 40 degree air? I wonder what 70 feels like? I just remember feeling numb when I finished my leg of the race. But us Johnstown kids are tough! 1. Set your pool heater to 92-93 degrees and keep it covered with either a solar blanket or thermal blankets when it’s not in use. 2. Consider a 3mm Wetsuit for yourself and a Kids Konfidence Wetsuit for students to keep them warm even when they exit the water. 3. Limit your lessons to 30 minutes. Limit your Novice Swim Team to 60 minutes. In the end, use common sense. If a child looks uncomfortable or says she’s cold, get her warm and ask her to come back when the weather is better. Secondly, follow the golden rule. Treat others as you would want to be treated. In other words, if a child’s parent doesn’t want their child to swim, respect their wishes as you would want them to respect yours. Lastly, if you teach in cool weather on a yearly basis but you keep the water 93 degrees warm, the culture will change. Swimmers and swimming parents are the most dedicated people you will find. As long as they know you care, as long as you take care of their children, you will have more and more swimmers every year taking advantage of your warm water (and helping you pay that gas/electric bill)! What Do the Best Swimming Instructors and Employees do Differently? Lee Atwater once said, “Perception is reality.” As swimming instructors and swim school owners it is so important that we take this quote seriously. 1. How does my facility look to our patrons? 2. How do I dress? 3. How do I interact with the children? 4. Do I make it a point to smile and say “hello _________” to each of my students? 5. Do I make it a point to smile and say “hello ________ ” to each of their parents? 6. Do I make it a point to smile say “hello” to facility employees, from custodians to supervisors? Be a class act and treat each of them with the same genuine friendliness. 7. How do I respond to the requests of my new supervisor? Do I question them in front of others or do I “embrace change” and treat them with respect? (If you have a valid concern or idea, talk to them in private. Let them know you have an idea or a thought you want to share. Now that makes a great impression!). 9. Do I make it a point to smile and say “have a great day” to parents, employees, and other patrons? 10. Am I looking to give them a little extra or a little less? These are the characteristics we want in Swim Lessons University swimming instructors! I am sure you can think of many more, and I welcome you to add your idea in the comments section. I appreciate you adding value to this blog! How quickly can a child learn to swim? This is a complex question, and quite frankly, the wrong question. It is so important that we, as parents, allow learning to swim to be a natural, enjoyable process. One that is fun, rewarding, and stress-free! Children naturally start setting goals on their own, especially if they are learning in a class with their peers or if the instructor is encouraging the child in a positive, motivational manner. It is critical that parents do not compare their child to the next, nor should any adults impose their goals on a child. Embrace the process, and let the child enjoy it. Learning to swim is a process, not an event. I understand that there is a financial motive to graduate a child from lessons as quickly as possible in some cases. But never forget that you are investing in a lifelong skill for your child. Look at the money, time, and commitment level we as parents will put into travel baseball, soccer, gymnastics, karate, etc. Look at the time and money dad puts into improving his golf game. When investing in swimming instruction, at the very least you are investing in a skill that your child will have his entire life for fun, safety, and fitness. At best, you are investing in the only sports skill that could save his life! 7. Unstructured swim time in the pool. • To help keep the parents expectations realistic. • To help the parents understand what their child is capable of learning. By 12 months old, infants/toddlers participating in Parent & Tot classes not only build comfort in the water, but they can begin learning the basic kicking skills, breath holding, breath control, and prerequisite skills to what will be instrumental to their progress over the next couple years. By 18 months old, toddlers participating in Parent & Tot classes will continue to refine their skills. 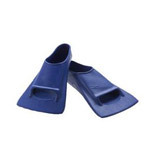 The skills they should continue to develop include the basic flutter kick, breath control, a Stage Two short surface swim with a progressive flotation vest (3-5 ft.), and the beginning progressions of the safety skills. 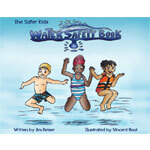 By 24 months old, toddlers can learn how to get back to the pool edge after entering the water from a seated position. IMPORTANT NOTE: This objective is possible IF the child has had the previous recommended instruction and experience, and has already mastered the 18-month old benchmark. 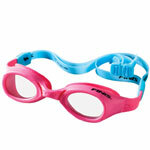 By 30 months old, toddlers can also learn to swim short distances (up to 10 feet) with their face in the water. IMPORTANT NOTE: This objective is possible IF the child has had the previous recommended instruction and experience, and has already mastered the 24-month old benchmark. By 36 months old, young children can learn how to consistently get back to the edge of the pool from a jump. 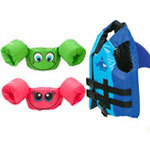 Young children at this age can also begin to learn the Surface Swim with a Pop-up Breath. IMPORTANT NOTE: This objective is possible IF the child has had the previous recommended instruction and experience, and has already mastered the 30-month old benchmark. By four years old, young children are capable of swimming across most any residential pool, face in the water, while using the pop-up breath to get their air. IMPORTANT NOTE: This objective is possible IF the child has had the previous recommended instruction and experience. By five year old, children are capable of swimming the length of most any residential pool using formal swim strokes like freestyle (front crawl) and backstroke. IMPORTANT NOTE: This objective is possible IF the child has had the previous recommended instruction and experience. By six years old, children are capable of learning advanced strokes such as butterfly, breaststroke, sidestroke, elementary backstroke, and even the skill of treading water. IMPORTANT NOTE: This objective is possible IF the child has had the previous recommended instruction and experience. By seven or eight years old, children are capable of swimming 100 meters (4 lengths of a Jr. Olympic-sized pool), using any variety of strokes to increase their safety in open water situations (i.e., rivers, lakes, ocean). IMPORTANT NOTE: This objective is possible IF the child has had the previous recommended instruction and experience.